Here are a few more wall display ideas that we have had tucked away! These are ideas that create a striking impact without spending a lot of money! These ideas are from old Domino magazines that I have stock piled around my home with sticky's in them! Creative sizing and layout of frames can help achieve a focal point in a space you may have not even considered useable space! And here is a great idea for a larger wall! Choose inexpensive frames, either 4x6 or 5x7 would work well and join them together on the back with duct tape to create a single dynamic unit! Choose a variety of images and plain paper for more drama - or even some artistic scrapbook papers in some of the frames would be a great look. 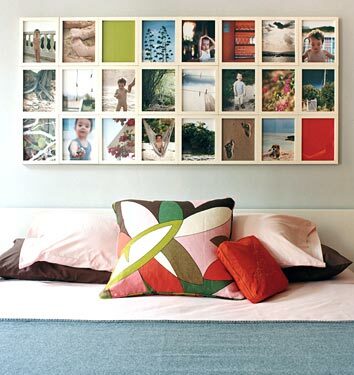 And of course, don't be afraid to paint the frames - purchase unfinished frames and be creative with your look!